Black Coffee, a house producer from Johannesburg. Hmmmm… yeah. Really? Does Shanghai really need more house music? Maybe that's a teaser, and the real headliner is Prince, or AC/DC fronted by Axl Rose, or David Bowie back from the dead, or…just anyone more relevant. Again, this is a rumor. Not confirmed. Don't freak out. 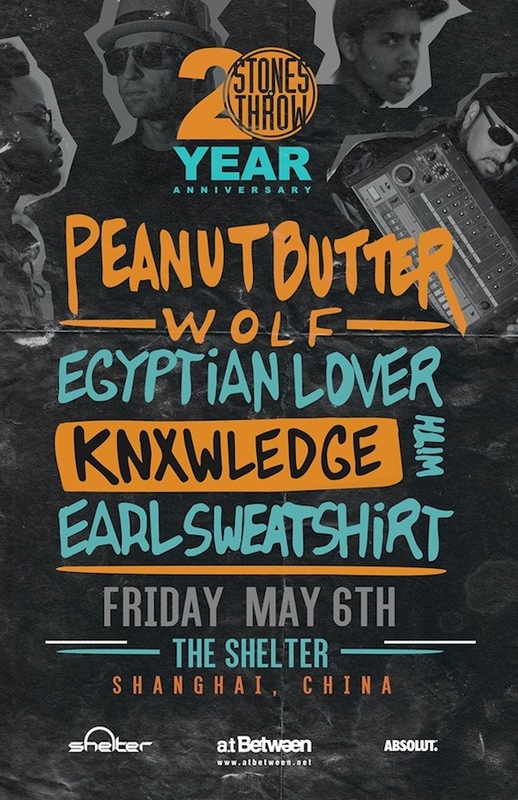 Bing: Peanut Butter Wolf, founder of Stones Throw, who played an insanely memorable set at Shelter a few years ago. Bang: Egyptian Lover, master of the 808, old-school party-rocker, super nice guy. Boom: Earl Sweatshirt, the young, much-hyped rapper who started out with the Odd Future crew and has already dropped two great full length albums at the age of 22. Ka-pow: Knxwledge, hip hop producer who's made beats for Kendrick Lamar and many more. Can't wait for that one. More news as we get it.